See Updated Cherokee Lesson plan here. Imagine that your country passed a law proclaiming that all of the land that you and your family had lived on for many years now belonged to the government. In addition to this you and your family were forced to leave your home under military supervision! With your group discuss the possible actions you might take in this situation. Consider the title of the reading selection The Long Trail of Tears, and also consider this list of words and phrases taken from the reading: English settlers, conflict, treaty, firearms, territory, gold, U.S. government. Based on this information, develop a scenario which reflects what you imagine happened to the Cherokee. 1. The Cherokee people are believed to have settled into their ancestral homeland in the southeastern United States sometime before 1,500 years ago. Linguists classify the Cherokee language as Iroquoian, but it is a distant cousin of present-day Iroquoian languages, suggesting that the Cherokee people gradually split off from the more northern Iroquois a long time ago. They slowly developed an extensive system of villages covering much of present-day western North and South Carolina, north Georgia, and eastern Tennessee, with a population estimated at 22,500 by 1650. 2. Villages scattered across this region were typically a hard day’s walk apart. The economy of the Cherokee inhabitants was based on agriculture supplemented with hunting and gathering of natural foods. But the economy also involved creation of clothing, decoration, baskets, pottery, tools, and weapons, together with trade for these items, often over long distances. Houses evolved from early woven branches and mud to substantial log cabins with smoke holes and doors. 3. The first contact between the Cherokee and Europeans occurred in the 1540s when Hernando De Soto, the Spanish conqueror of Peru, led an army of exploration and conquest from Florida up through Cherokee territory and into the central United States, primarily searching for gold and other riches. De Soto died of fever on the banks of the Mississippi River in 1542. Other Spanish expeditions entered the territory at long intervals over the next 100 years, and the fact that much of the Cherokee territory lay in the Appalachian Mountains tended to minimize the contact between the Cherokee and the Spanish. 4. During the 1600′s, contact and conflict grew between the Cherokee and the English settlers growing outward from the Virginia colonies. During this period the Cherokee and tribes acquired firearms, and also substantially fortified their towns. This period was a tangled web of wars and alliances between Indian tribes including the Cherokee, Tuscarora, Creeks, Chickasaw, and Shawnee. There were also conflicts between the Indians, the British, the French, and the American colonists. Then the first smallpox epidemic, probably brought to Carolina by slave ships, broke out about 1738, and had a devastating effect on the Cherokee as well as other tribes because they had no natural immunity. During the American Revolutionary War of 1775–1783, the Cherokee and many of the other tribes sided with the British against the colonists. 5. Following the British defeat, some groups of Cherokee moved west of the Mississippi River to reside in Spanish territory, primarily in present-day Arkansas. This territory was ceded by Spain to France, and shortly thereafter, Napoleon sold it to the new United States as part of the Louisiana Purchase. Immediately from that time, President Thomas Jefferson and the Congress put steadily increasing pressure on all of the eastern tribes to move west of the Mississippi river into the new territory. 6. Even during this difficult time, Cherokee culture continued to grow and flourish. Between 1809-1821, the deservedly famous Cherokee scholar *Sequoyah, after observing a book for the first time and referring to it as Talking Leaves invented a syllabic alphabet (a “syllabary”) for the spoken Cherokee language, and used that to establish a system of writing Cherokee. Within several years, it was in wide use in the Cherokee nation, and a newspaper, the Cherokee Phoenix, began publication using Sequoyah’s syllabary in 1828. This was the first American Indian newspaper published in the United States. 7. The pressure to move west increased, and only became worse when gold was discovered on Cherokee lands in North Georgia in 1828. The U.S. Congress passed the Indian Removal Act in 1830, but the U.S Supreme Court ruled that the Cherokee were a sovereign nation and removal could only be archived via negotiated treaties. Unfortunately, political divisions among the Cherokee led to the signing of just such a document by a small minority of Cherokee. Despite the fact that the Cherokee had fought with him in the Creek War (1813-14) and reputedly saved his life, then-President Andrew Jackson exploited this signing to use the U.S Army to force the removal of the Cherokee people from the east to new territories in Oklahoma. This episode has become known as the infamous Trail of Tears. More than 17,000 Cherokee were forced to move over 2,200 miles, and more than 4,000 died in the process. 8. The Indian Removal Act applied to Cherokees living on communally owned tribal land. Cherokees who lived on private land along with some others who had evaded the army, continued living in the Great Smoky Mountains of North Carolina, and their descendants today constitute the Eastern Band Cherokees. The Western Band Cherokees, located in Oklahoma, derive from those who made the march. In the late 1800s and early 1900s, the western group was still plagued by conflicts with settlers for lands, and both bands suffered from misguided government policies, including the forced education of Indian children in government boarding schools away from home, and from attempts to discourage use of the Cherokee language. 9. Today, the majority of the Cherokee Nation reside in western Oklahoma. They have their own schools and an excellent educational system. The tribe also does well in business and economic development. They are the second largest tribe in the United States, with over 200,000 tribal members. They have the sovereign right to exercise control over all tribal assets. Sequoyah (circa 1767-1843) was a Cherokee silversmith who created the writing system known as the Cherokee syllabary, making it possible for people to read and write in Cherokee. Sequoyah completed the language system in 1821. The Cherokee Tribe officially adapted his syllabary in 1825. Due to their syllabary teaching, the members’ literacy rate rapidly increased, and surpassed that of the European-American settlers located nearby. Directions: The following vocabulary words (in bold font) are from the reading selection you’ve just finished. Find and highlight each of the following words in the paragraphs indicated in parenthesis, then infer the meanings from the context. Highlight any additional words that you aren’t familiar with and do the same with those. Check your answers with your group members, then refer to your dictionary or thesaurus to confirm your answers. 1. What evidence was there that the Cherokee people originated from the Northern Iroquois? 2. What did the early Cherokee economy consist of? 3. Describe the first dwellings of the Cherokee. 4. Was finding the Cherokee people the primary reason for De Soto’s expedition? 5. After the death of De Soto, what factor contributed to the minimal contact between the Cherokee and the Spanish? 6. In 1828 what discovery led to the increased pressure on the eastern Cherokees to move? 1. During the 1600s numerous wars occurred between the Cherokee and other American Indian tribes. What do you think caused those wars? 2. Why were the Americans, British and the French also at war with the Indians? 3. What made the Cherokee side with the British during the American Revolutionary War (1775-83)? 4. Why were the Cherokee children forbidden to speak their language and forced to learn English during the 1800s and 1900s? Directions: Choose a person or an event from the following list for research and prepare a presentation for class or for group discussion. 1. Write an essay in which you express your opinion on the events leading up to and including the Trail of Tears. 2. Write an essay in which you discuss the small pox epidemic and the effect it had on the Cherokee and other tribes. Some L2 learners may not understand what certain animals (or insects) look like. Here are some photos to go with the myth. Possum and Baby. Cute Photo: From Artist Cassandra Tondro’s site. 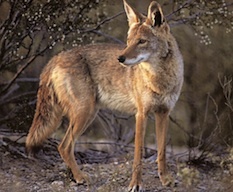 A Coyote. Beautiful Photo- True Wild Life. 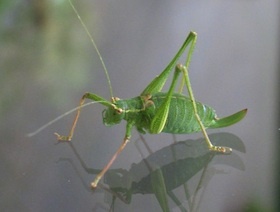 A Cricket. Photo- Baby Turtle blog. 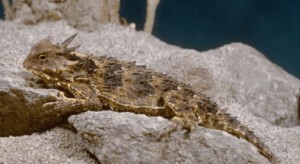 A Coastal horned lizard. Credit- Science magazine. Just as their forefathers did in the past, Cherokees today enjoy telling stories. Many of these myths usually have a moral for young ones to learn. A good many of these wonderful stories involve animals who possess human characteristics…including human flaws, as the following story demonstrates. “Possum had a long bushy tail. He was very proud of it, combing it out every day. If anyone came over to his house, he would show off his tail right away. Coyote didn’t like this. Everyone laughed at Coyote’s tail. They said it was all scratchy and full of weeds and dirt. “You come along then,” said Coyote. “We’ll have a special place for you. I will even send Cricket over to comb your tail out and dress it all up for the dance.” Possum was very pleased with this offer. Coyote went over to see Cricket and they had a talk. Cricket was the best haircutter anyone knew. In the morning, Cricket went over to see Possum and told him he was there to fix up his tail for the dance. Possum stretched out and Cricket went to work. When he was all through combing and smoothing the hairs, he wrapped Possum’s tail in a bright red string. Cricket said, “Possum, this string will keep all the hairs smooth until the dance. When you get to the council and it’s time to dance then you can take the string off.” When it was night Possum went to the lodge where the dance was to be and found that the best seat was ready for him. When it came his turn to dance, he loosened the string and stepped out into the middle of the floor. The drummers began drumming and Possum began singing, “See my beautiful tail!” Everyone shouted and Possum danced around and around. “See how fine the fur is!” The people shouted more loudly than before and began laughing. “Look how it sweeps the ground!” All the people were laughing now and Possum was wondering what it meant. He stopped dancing and looked around at the circle of animals. They were all laughing at him. Then he looked at his tail. There wasn’t any hair on it at all! His tail looked like Lizard’s tail. Cricket had cut off all the hairs at the root and now they were scattered all over the dance floor. Directions: With a partner, reread the myth and highlight the following words from the reading. Match the words from the myth with their meanings by placing the letter of the word next to the meaning. 3___ a meeting place for a group of people. 4___ to move or cause to move along by turning over and over. 5___ having an inordinately high opinion of oneself; arrogant or haughty. 6___ a toothed device of metal, plastic, wood, used for disentangling or arranging hair. 7___ something strange; a mixture of surprise and curiosity. Directions: Without rereading the myth, match the character to his phrases. Then check your answers in the reading. Directions: The myth you’ve just read deals with the topic of feelings. Think about how different situations can affect the way you sometimes feel. The following sentences describe situations that can affect how you feel. Read a sentence and then either choose one of the words from the list below or supply your own word to describe how you would feel. You may use a word more than once. If you slipped and fell, and everyone laughed, you would probably feel angry. 1. You are coming out of the store with a bundle of shopping bags, and somebody bumped into you without saying, “Excuse me”. 2. You just found out you won 5,000 dollars! 3. Your lover brings you a beautiful flower, and it isn’t even your birthday. 4. It’s a beautiful sunny day and everyone you see smiles at you! 5. You have just heard that one of your relatives has had an accident. 6. Your best friend tells you she/he really desires your boyfriend/girlfriend. 7. You have just received the highest grade in your class! Note: This additional material focuses more the Cherokee people themselves, and less on the historical events. For historical background information see the original Cherokee Part I. 1. The Cherokee depended primarily on hunting and farming for their survival. They hunted mainly deer, and the people used every part of the animal. Nothing went to waste. Some of their farming produce included beans, melons squash, pumpkin and corn. The men also fished to supplement their food supply. They made bows and arrows, nets, spears, blowguns and farming instruments. The women were responsible for maintaining the home, and farming. 2. Like many of the aboriginal people the Cherokee wore clothing made from animal skins before the Europeans introduced cloth to the Cherokee. Even into the 1800’s the men wore leggings made of deer hide in order to protect their legs from thorns and underbrush. The men wore tops called hunting shirts with their leggings. Women wore tops, skirts and sometimes thick blankets in winter. Both men and women wore moccasins on their feet. 3. The Cherokee made jewelry of shells, silver, and clay beads. They also made clay pots, baskets, masks and rattles, which were used in religious ceremonies. 4. They resided in villages with up to as many as 500 people in each. The homes in the winter were round in shape and made of wood covered with mud for insulation. Each house contained a hole in the top known as a smoke hole, the purpose of which was to allow smoke to escape from the fires within the homes. During the warmer weather, homes were cone shaped and made of bark. To keep out the heat and insects, they were covered with grass. They were fashioned to stay cool inside with plenty of light. 5. Traditionally the Cherokee were a matrilineal family organization, where the women had autonomy and authority in their homes. After marriage the man usually joined his wife’s household, and the offspring of the couple became members of their mother’s clan. Women also maintained their own property. Although Cherokee women might have participated somewhat in tribal affairs (some women even fought alongside the men in wars) they were not allowed to hold positions of power, such as those of chief or as council members. Neither were women allowed to become religious leaders. 6. The Cherokee political system in each village operated as follows. Each village had a red chief and a white chief. The function of the white chief was to rule during times of peace, while the red chief took over leadership during times of war. In this manner, the people were never without a leader in a time of crisis. Below the chiefs was the village council, whose function was to help make decisions for the tribe. The people as a whole believed in group cooperation as opposed to the needs of the individual. 7. For their religious functions, the Cherokee tribe had very special men known as Shaman or Medicine men, who were revered by the rest of the tribe. The medicine men served many important functions within the tribe. They presided over ceremonies including those centering around war, they took care of the sick, and created cures for many of the illnesses. Since the deer was the primary animal the Cherokee depended on for many of the necessities of life, one of the deities they worshiped was the Deer god. Like most aboriginal people, the Cherokee believed that everything (including inanimate objects) had a spirit. They especially believed in animal spirits. 1. Today the Cherokee still hunt, but only during specified times of the year and some people still grow their own produce. Now, however they buy most of their food at supermarkets and grocery stores. During ceremonies, especially for religious ones, Cherokee people will wear their traditional regalia. Most people usually buy their daily clothes from department stores. 2. Cherokees still practice the art of jewelry making, and the women are still known for their beautiful baskets, which they sell at festivals held on the reservation. Also, the people live in ordinary homes located on the reservation. 3. Within the family unit, men and women are considered equal to each other, although the matrilineal tradition is still observed. Women have jobs outside of their homes. 4. Politically, the Cherokee people made progress in 1987 when a Cherokee woman named Wilma Mankiller was the first female in modern history to win the position of Principal Chief of the Cherokee Nation of Oklahoma. Initially, there were people who opposed her candidacy because they objected to being led by a woman. During her campaign there were many people who openly spoke against her. She even received several death threats! 5. Through hard work and dedication, Wilma eventually won the people over. Her programs provided improvement for the people in areas such as education, housing and employment. Through her leadership the tribe has gained autonomy within the Cherokee communities. Until her election, many females thought they could never attain the position of chief. Wilma Mankiller eventually retired due to illness. Today, women also work in the same fields as the men including industry, education, and business. 6. The religious practices of the tribe today vary, from clan to clan, and are too complex to write about in detail here. The Cherokee still have religious ceremonies in which the tribal members still dress in their regalia. Directions: The following sentences are from the reading selection you’ve just read. Try to infer the meanings of the words in bold font. The sentences can be found in the paragraphs indicated in parenthesis. Highlight any additional words that you may not be familiar with and try to guess their meanings as well. Check your answers with your group members, then refer to your dictionary or thesaurus to confirm your guesses. 1. What are some differences between the Cherokee culture of the past with the culture of today? 2. What are some of the similarities? 3. Discuss a situation in which group cooperation might have been beneficial for the Cherokee in their past. Has group cooperation benefited the tribe today? In what way? 1. Why do you think the Cherokees were and still are a matrilineal people? 2. List what you think might have been some of the duties of the White Chief (paragraph 6). List some responsibilities of the Red Chief. 3. Provide some reasons for the initial negative response to Wilma Mankiller’s candidacy for tribal chief. Directions: Choose one of the following questions and present the results of your research. • List and describe some of the current Cherokee ceremonies? • Before Wilma Mankiller became chief, what was her life like as a young girl? • Have there been other female chiefs leading the Cherokee tribe since Wilma Mankiller? • What are your thoughts about females running for political positions? • Write an essay in which you compare Wilma Mankiller’s situation to that of other females who have run for office in other countries. The goal of this material is to raise students’ awareness of the American Indian people living in the United States today, and to encourage learners to view Native Indians as an integral part of American society. My hope is that students will see the native people of this country as workers, students, professionals, parents, and leaders of their communities. The construction of the exercises makes the reading material more of a communicative activity, and helps students to better understand the content. There are various pre-reading, while-reading and post-reading tasks for each reading selection. Although the majority of the exercises are suggested for group work, especially during class, students can complete the activities independently as homework assignments. At the following class meeting, their responses can be used as the basis for group discussions. The research activities can also be completed individually or as collaborative group projects. I offer some suggestions for some of the activities throughout the lessons. The target skills for the lessons are primarily reading and speaking, however, tasks for writing, and research activities are also included. These exercises are intended for ESL students, but everyone can use them. Although the reading level is high-intermediate to advanced, teachers can modify the material as needed for their level of learners. The Teachers’ guide offers suggestions for how to use this material. Please feel free to email and let me know if there is anything more I can offer. Suggestions are welcome. The first question draws on the students’ personal experiences and imagination. Place students in groups of 4-5, and while members are completing the first question, you can write the title and list of words on the board in preparation for the second question which is a task concerning prediction of the content of the reading. Some possible questions to ask about the title: What is a trail? What are tears? Who could be crying? Why would anyone cry in this situation? Who were the English settlers? What connection could they have to the title? ancestral: belonging to or inherited from an ancestor. Linguists: a specialist in linguistics; person who speaks or studies more than one language. agriculture: a large-scale farming enterprise. evolved: undergo development or evolution. smoke holes: a vent (as in a roof) for smoke to escape. expeditions: an organized group of people undertaking a journey for a particular purpose. fortified: to make strong or stronger. devastating: physically or spiritually devastating. ceded: give over; surrender or relinquish to the physical control of another. sovereign: of political bodies; an autonomous judiciary. reputedly: according to general belief. descendants: deriving or descending from an ancestor. The answers are taken directly from the reading, and the paragraphs for the answers are in parenthesis. For your learners with a lower reading level, you might want to give them the paragraph numbers to help them locate the answers. 6. The Cherokees were pressured to move west when gold was discovered on Cherokee lands in North Georgia in 1828. Racial or cultural conflict: tribes looked different and dressed differently from each other, and sometimes observed different traditions, which might have caused suspicion between the groups. Personal conflicts might stir up battles. 2-They all wanted the land from the Indians. 3. The Cherokees mistakenly thought that if they helped the British get rid of the Americans; the Indians would get their lands back. 4-The Americans felt that if the children learned English and forgot their native language, the Cherokee children would grow into the American culture and forget their original culture, which many of them did. 3. Principal Chief (n.) the main or primary leader. Suggestions: For this group exercise, students could create a chart like this one. 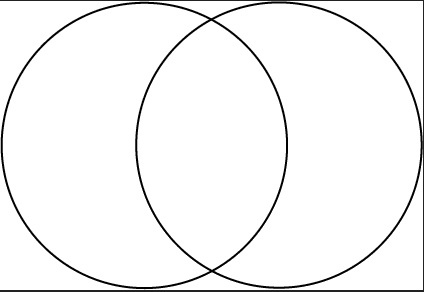 Suggestions: For this group exercise, students could create a Venn diagram like this one. Matrilineal organization still in existence. Religious traditions and ceremonies still observed. Basket and jewelry making still flourish. Many traditional dishes still cooked. 3. If the Cherokees had banned together before they signed the treaty, which triggered the Indian Removal Act, they may not have been removed from their lands. Today they are working together and thriving as a group to maintain their language and culture. The Red Chief: kept the military men organized and in good physical shape; kept the weapons in good working condition; dispatched search parties to continuously check for enemies. Traditionally, the Cherokee always had designated male chiefs, so some were opposed to a female; some women also opposed Mankiller. It went against tradition. Exercise 12-Reading-Can You Recall the Characters?